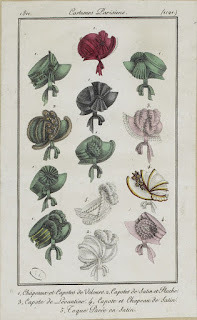 Quite a few of these I have neither the materials and tools, nor the skills to make, but how I love them. 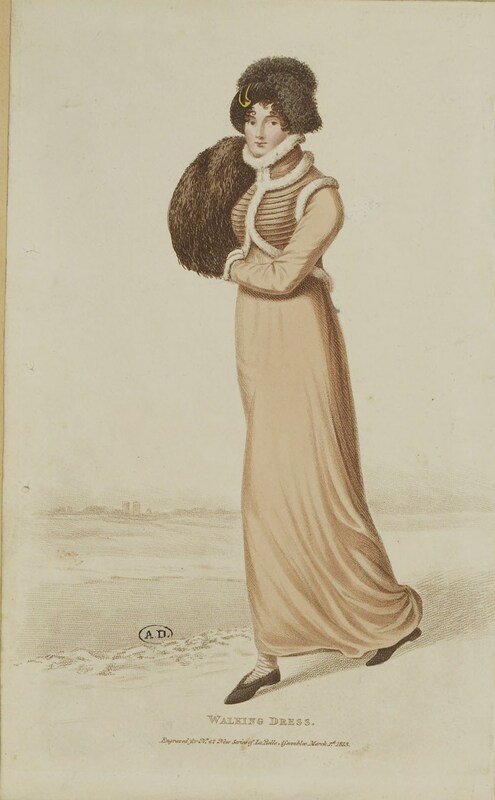 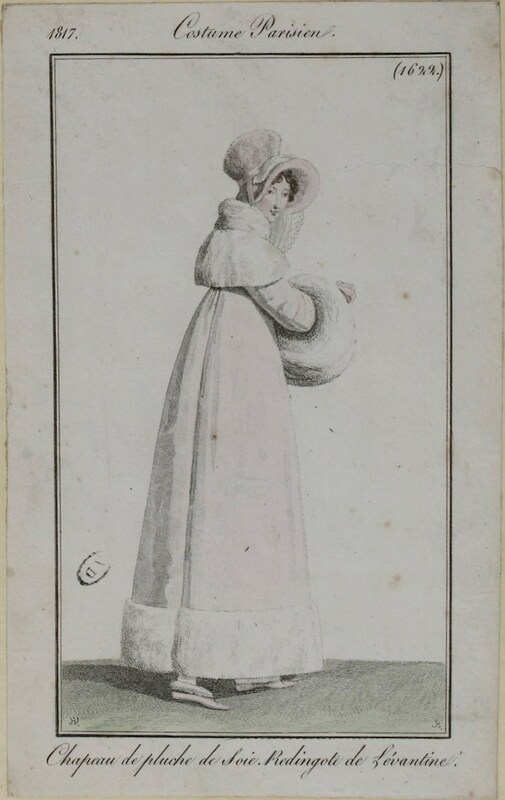 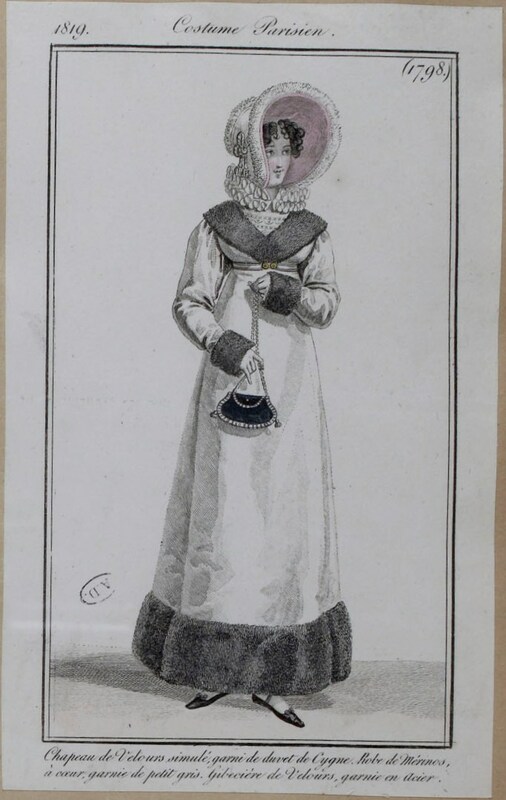 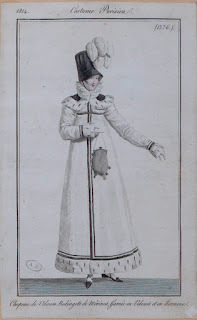 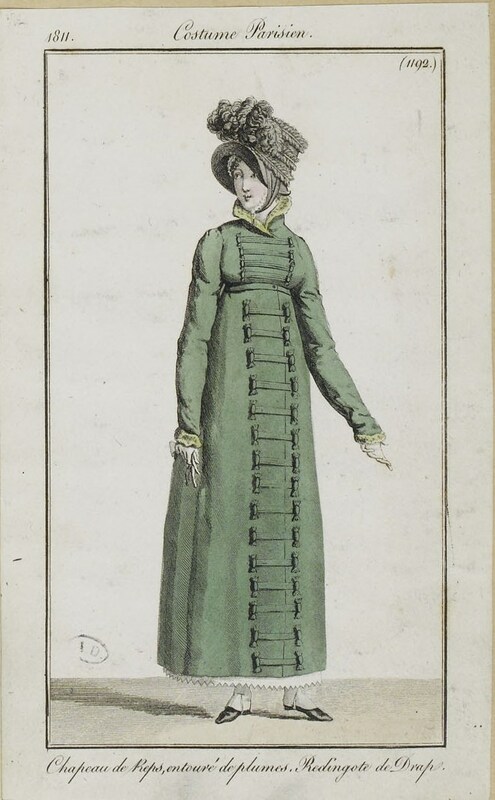 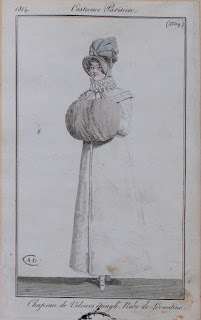 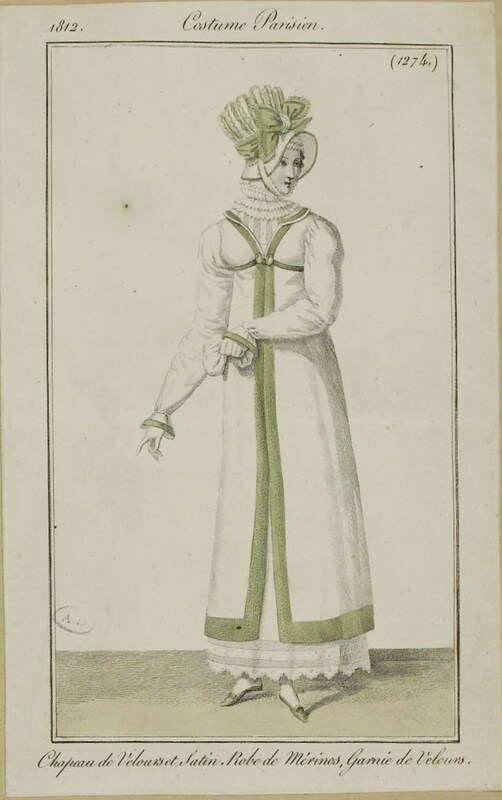 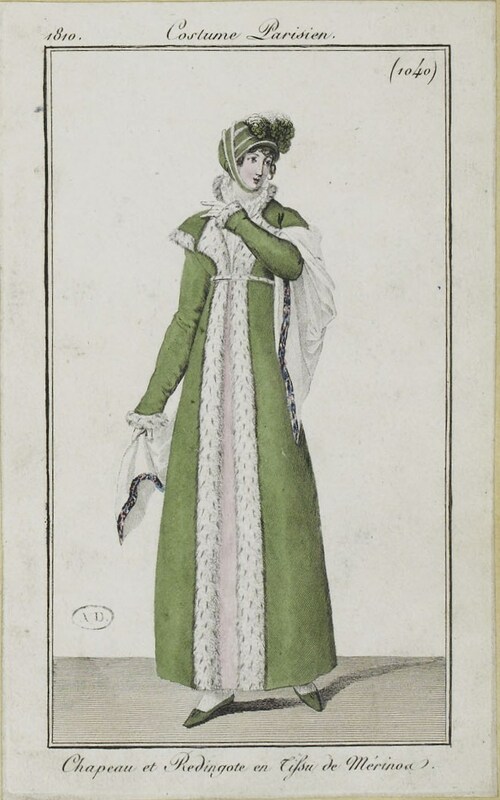 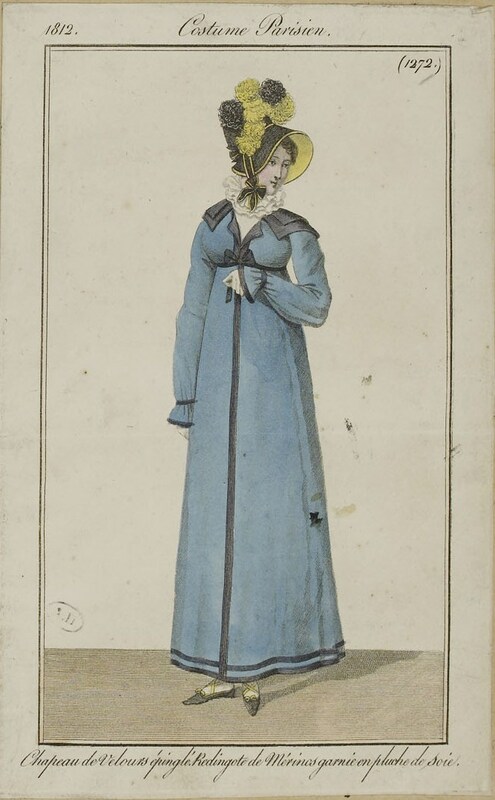 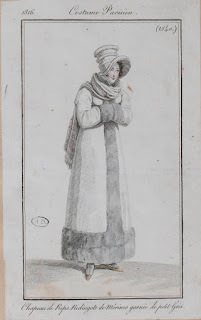 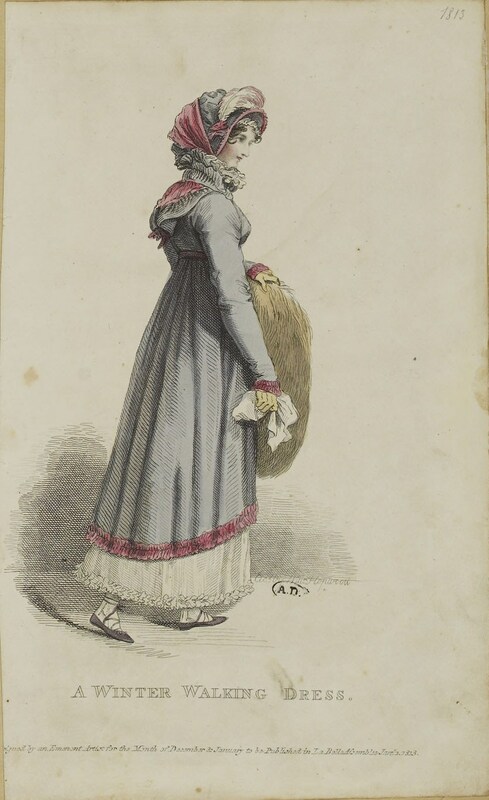 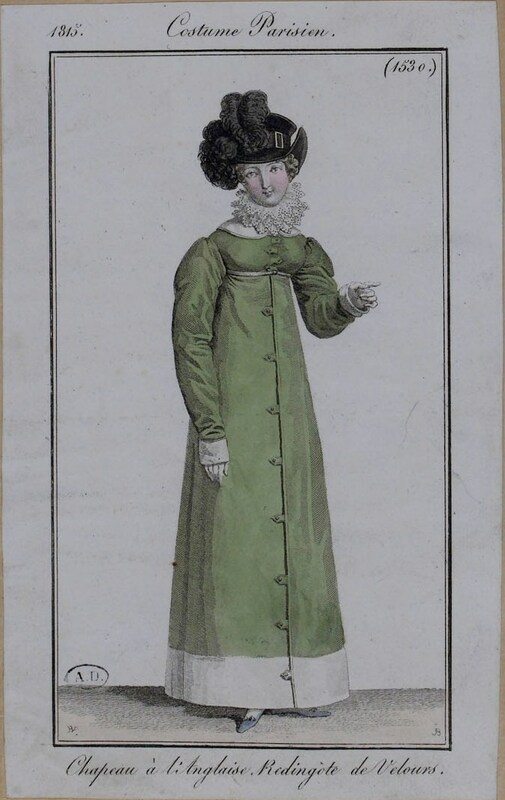 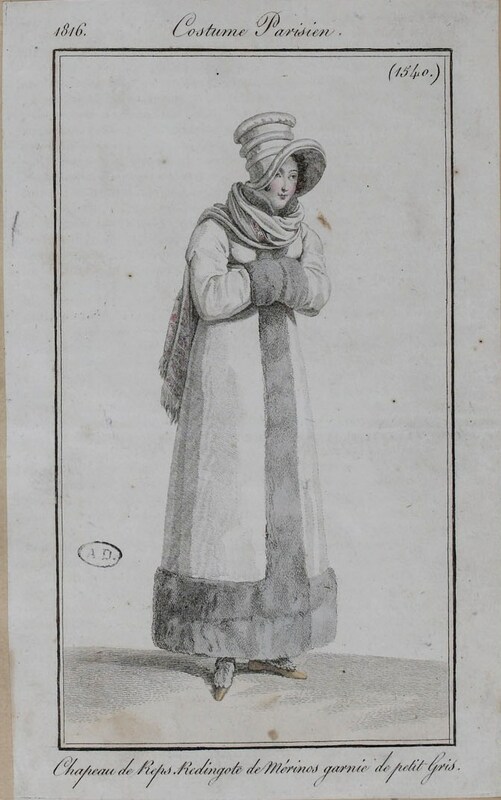 Bonnet made from Levantine (probably a wool fabric) trimmed with plush, lined douillette (the coat). Redingote and bonnet from velvet. 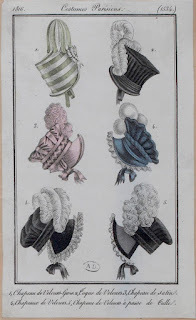 Merino redingote, bonnet trimemd with plush and three plumes. 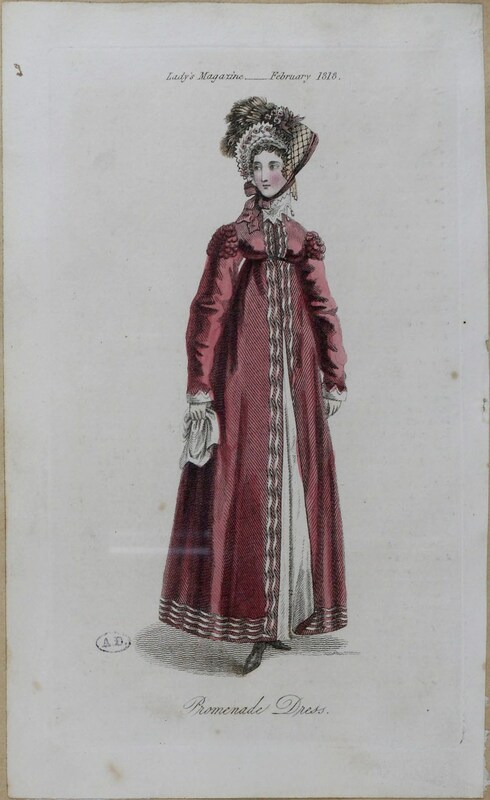 Redingote of woollen cloth, velvet bonnet. 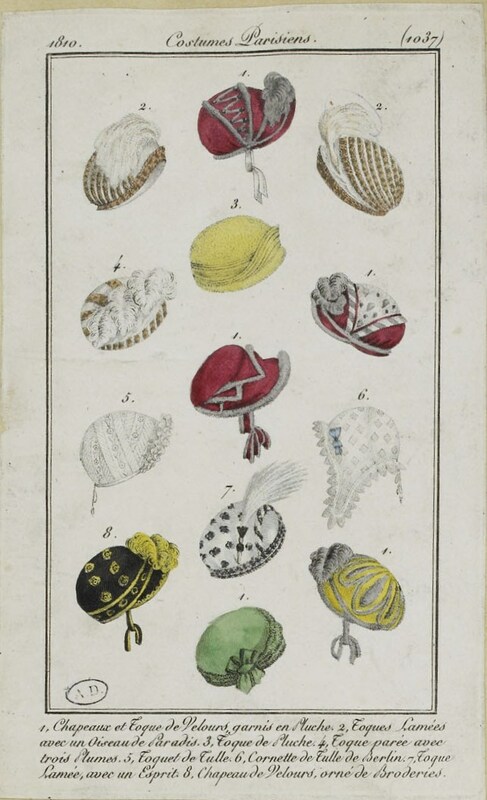 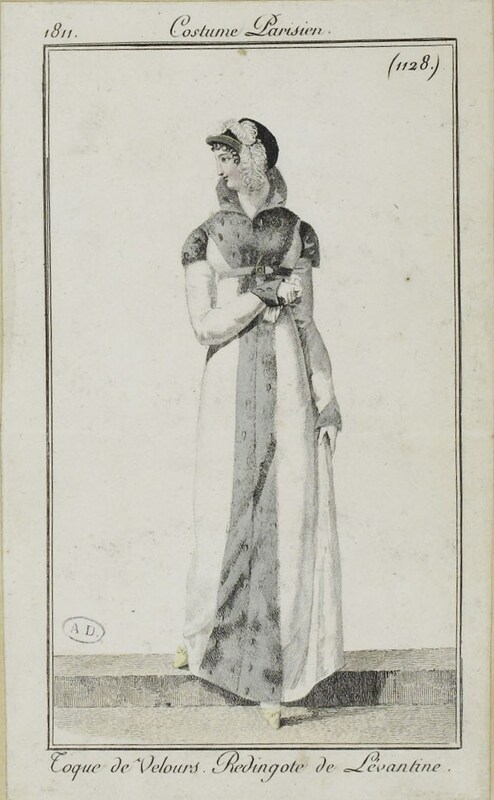 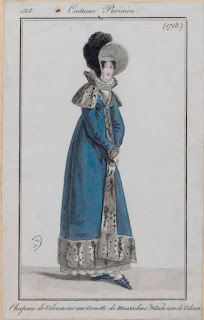 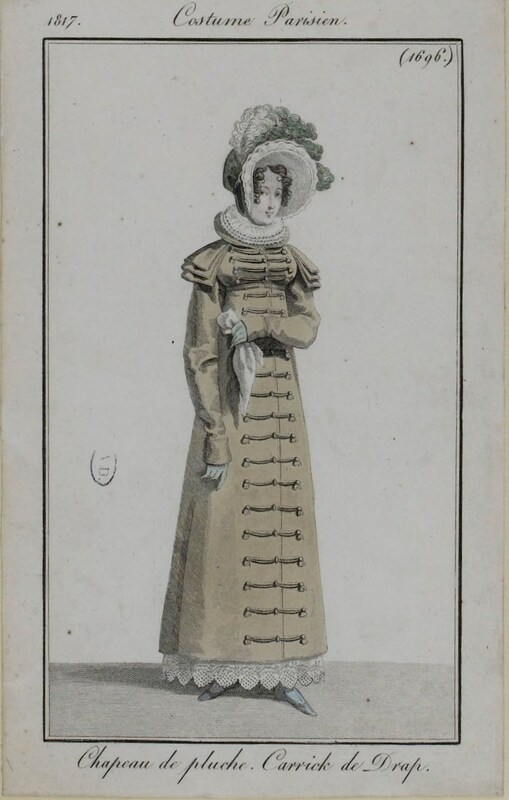 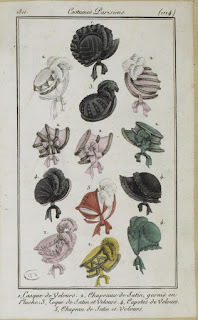 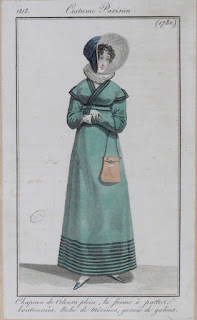 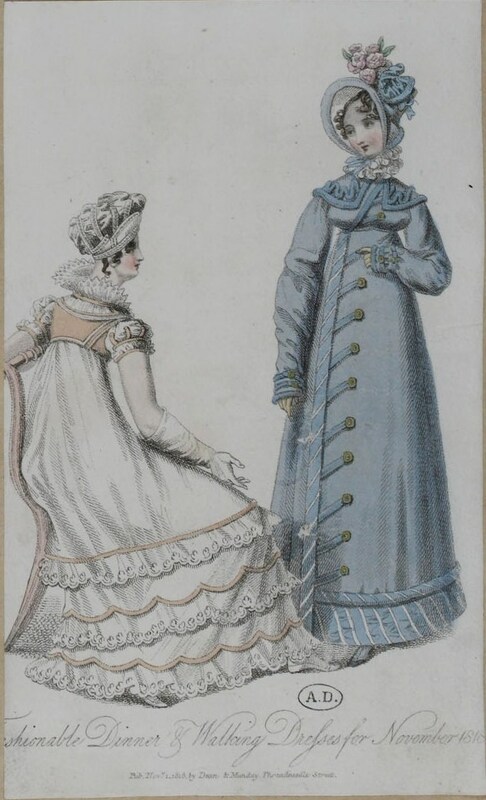 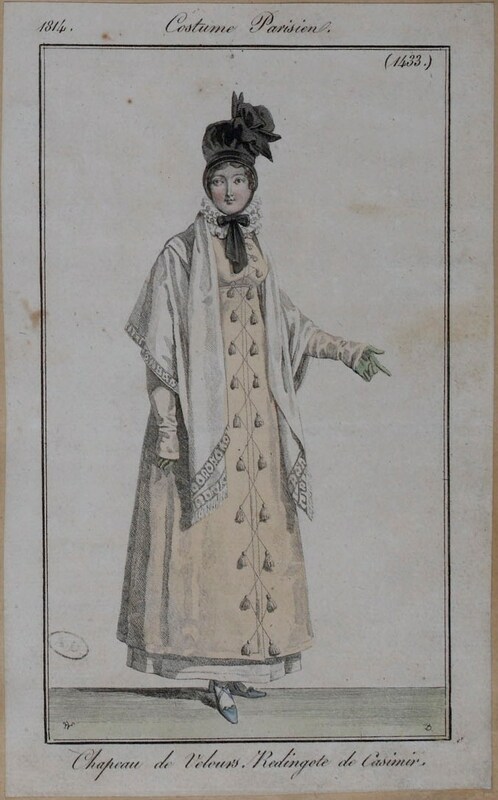 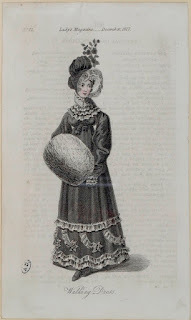 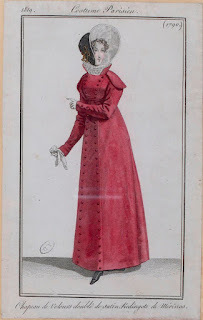 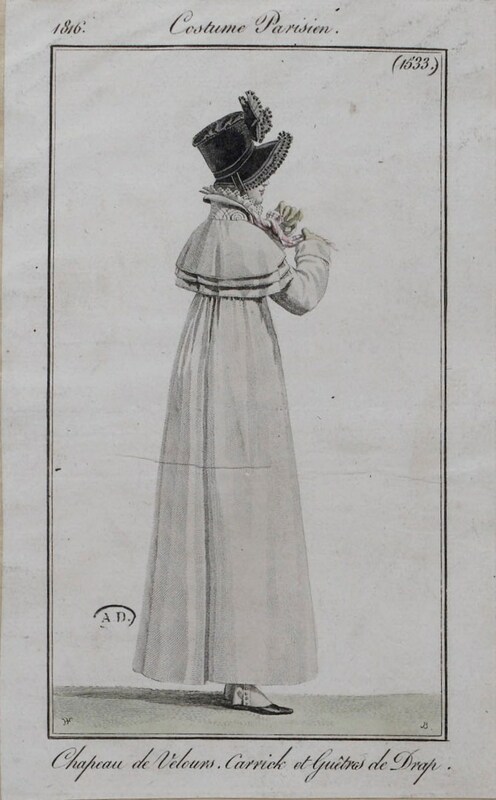 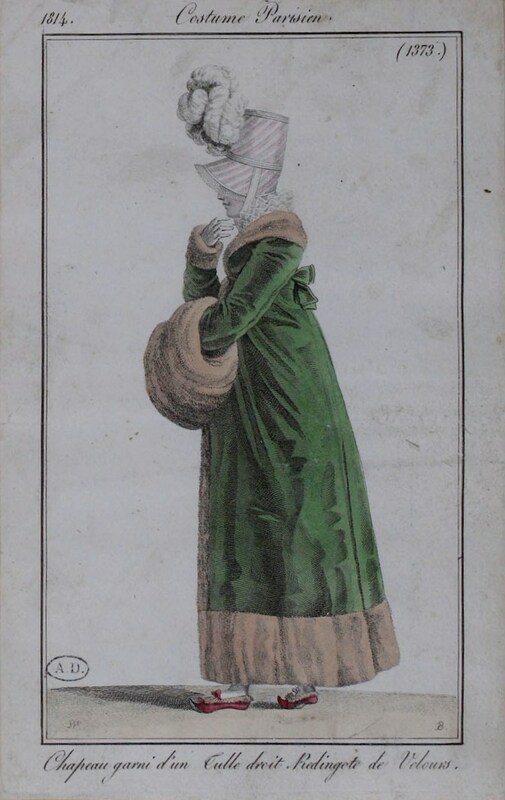 English fashion magazines didn't state the materials in the fashion plates, though undoubtedly did so in the accompanying text. 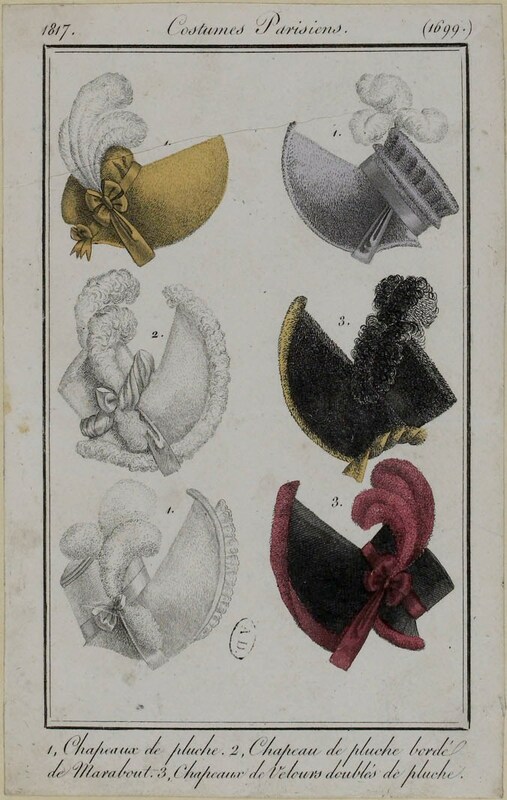 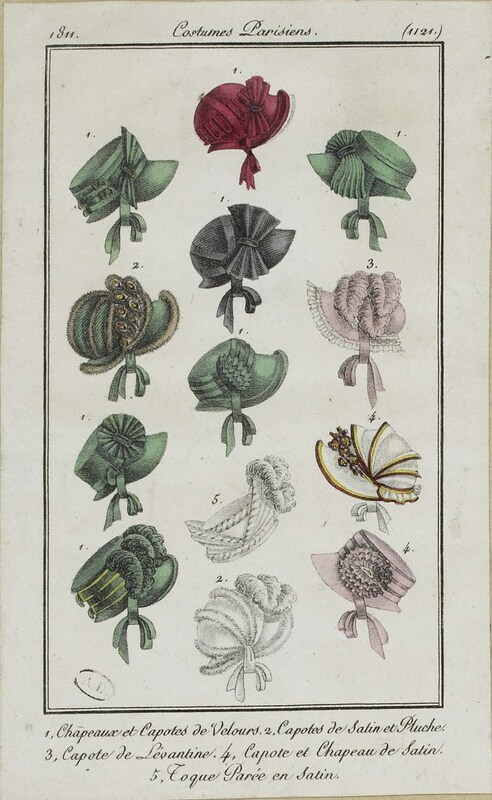 A mix of bonnets, some of them made in velvet. Bonnet made of "reps", woollen cloth redingote. Bonnet of levantine, redingote of woollen cloth. 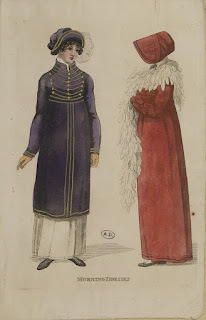 Redingote made from levantine, velvet bonnet. Various bonnets from velvet, satin and plush. Redingote from merino, trimmed with silk plush, velvet bonnet. 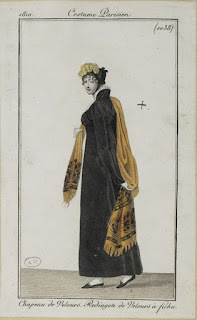 Merino gown trimmed with velvet, boinnet made from velvet and satin. And another one, in the Hussar style. Coat of Levantine, velvet bonnet. Merino gown trimmed with velvet and ermine, velvet bonnet. 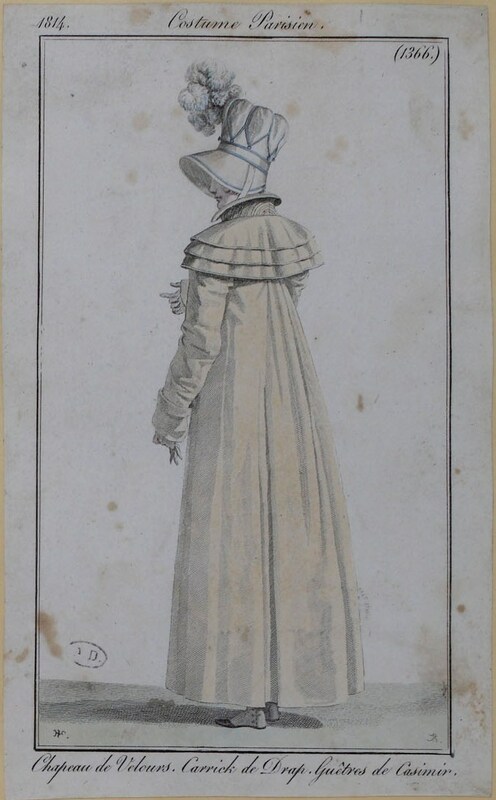 Velvet redingote, bonnet trimmed with tulle. "Carrick", a coat derived from male English driving coats, made from woollen cloth and a bonnet made from velvet. 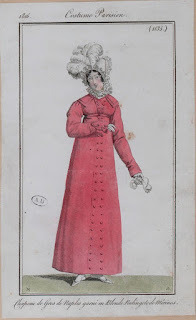 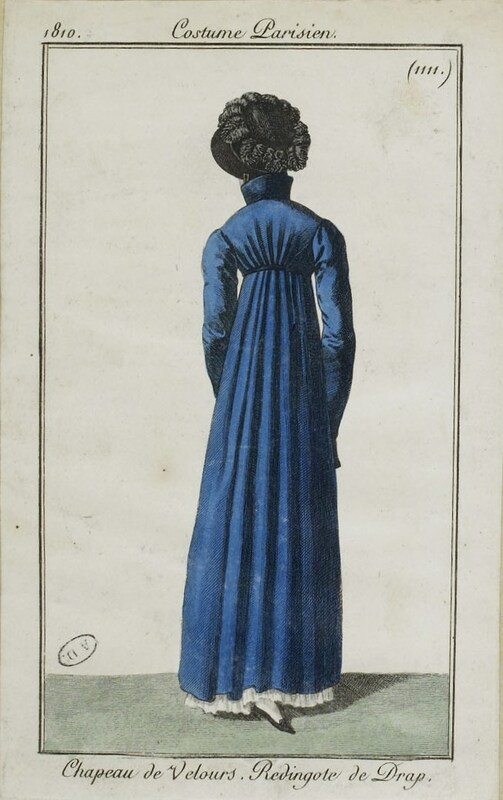 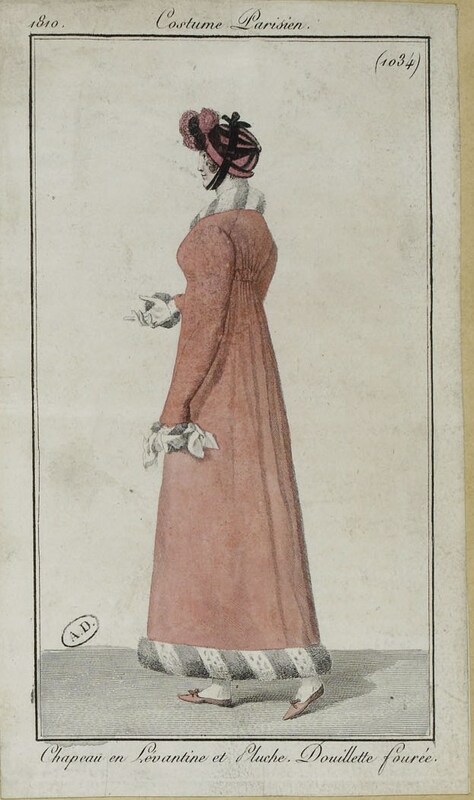 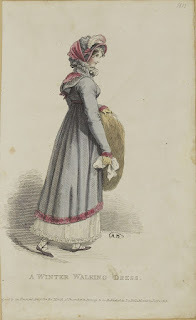 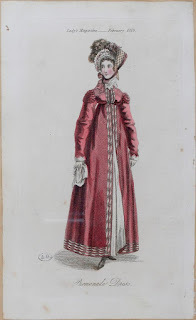 Velvet redingote, bonnet à la Anglaise i.e. 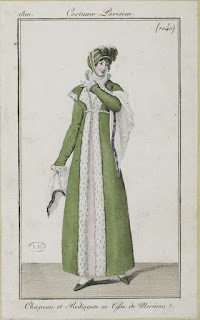 in the English style. 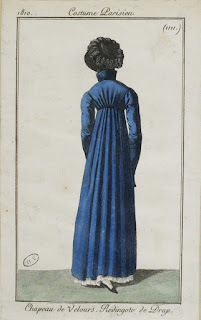 Merino gown trimmed with velvet, velvet bonnet. 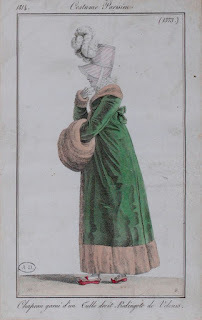 "Carrick" from woollen cloth and a bonnet made from velvet. 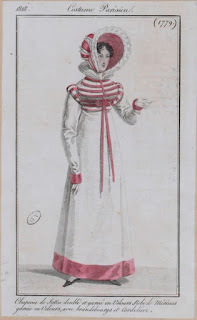 Redingote of merino, bonnet from gros de Naples (grosgrain silk) trimmed with lace. 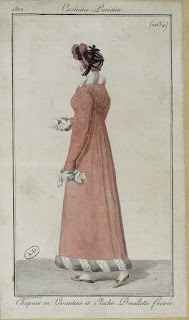 Merino redingote trimmed with squirrel, bonnet made of "reps". 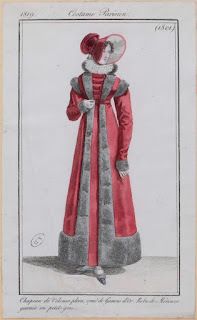 Gown from merino trimmed with velvet, fur stole made from marten. No material given for the bonnet. 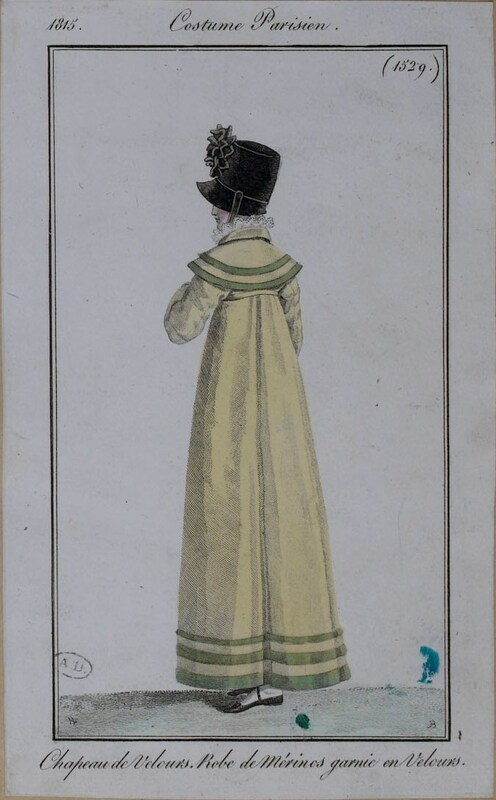 Another carrick from woollen cloth and velvet bonnet. 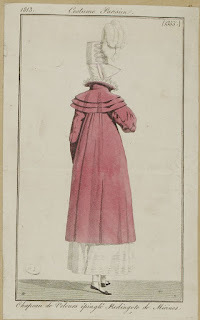 Merino redingote and velvet bonnet. 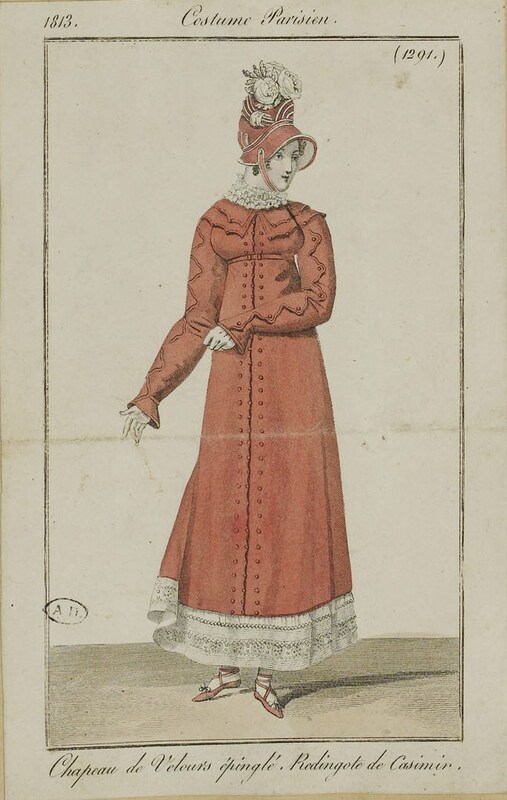 Redingote in Levantine (wool fabric), bonnet made from silk plush. 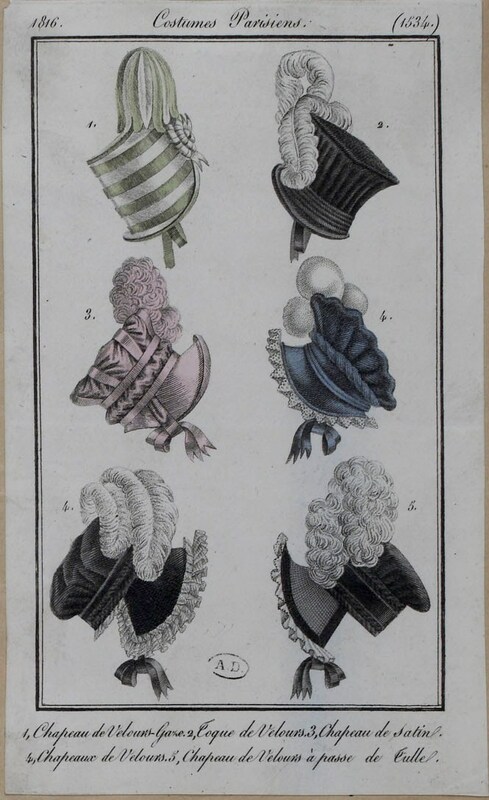 Carrick from woollen cloth, plush bonnet. 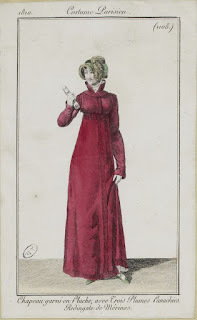 Satin bonnet trimmed in velvet, merino gown trimmed with velvet and Brandenburg braid. 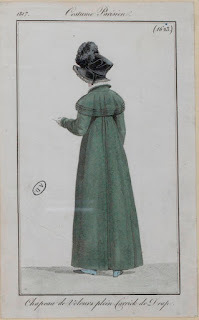 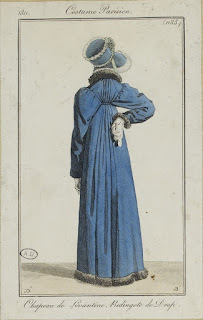 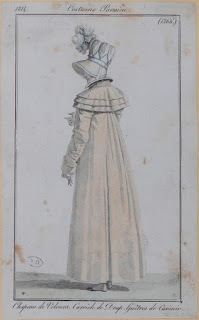 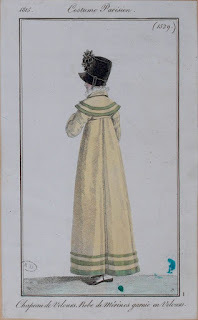 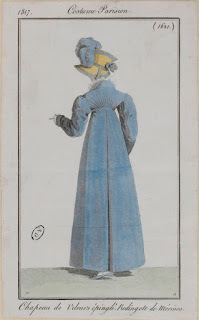 Coat of velvet (Witzchou), velvet bonnet with a muslin cap under it. An English walking dress for November. Merino redingote, velvet bonnet lined in satin. 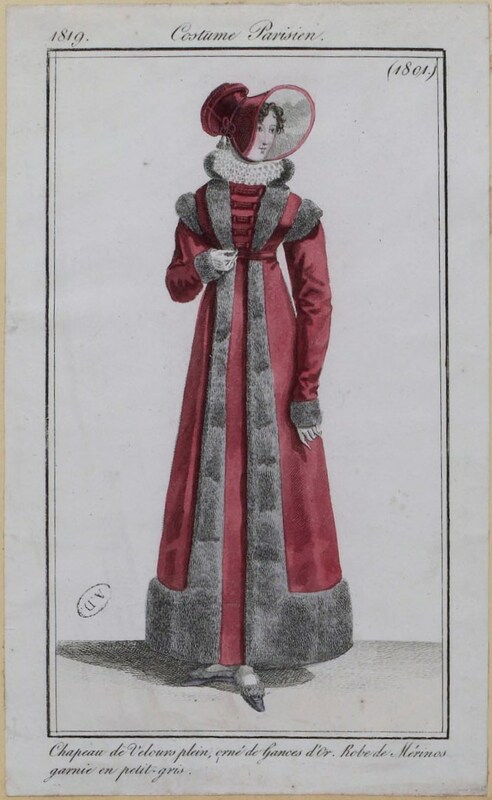 Merino redingote trimmed with squirrel fur, velvet bonnet, according to the text trimmed with gold, though that can't be seen in the image. 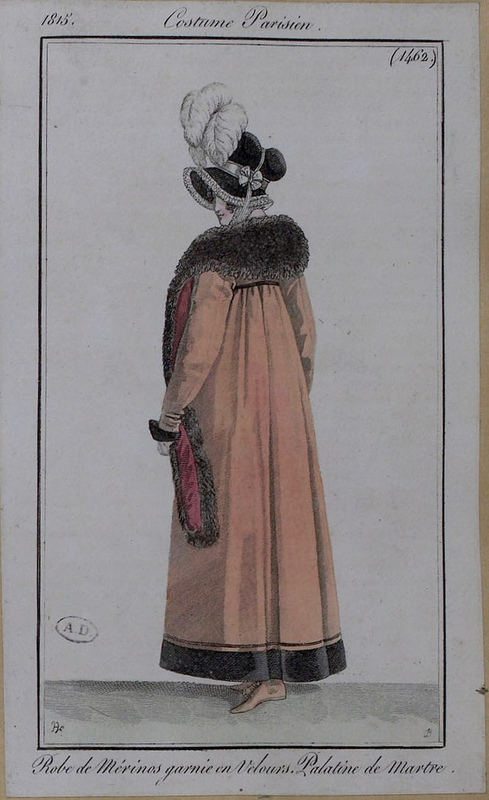 Merino gown, trimmed with squirrel fur, velvet bonnet trimmed with swansdown.